One of the greatest concerns of public and private sector leaders in an age of system vulnerability is Trust. Trust is at the center of most transactions; without it, commerce comes to a halt. As a result, a people-first, technology-enabled, approach to mitigating cybersecurity vulnerabilities is a growing trend to protect this critical nucleus of commerce. Major General Dale Meyerrose – first Presidentially-appointed, Senate-confirmed CIO for ODNI – succinctly stated, “Cyber Security is what you do – not something that you buy.” Many organizations are now infusing the responsibility of security awareness and critical thinking into the non-technical culture of the organization – business, marketing, finance, accounting, human resources and operations. A first step in this cultural transition is asking the right questions. The National Institute of Standards and Technology (NIST) – an agency of the Department of Commerce – has released one of the most comprehensive, and widely adopted, frameworks that provides guidance in assessing organizational maturity across five functional areas for cyber security – Identify, Protect, Detect, Respond and Recover. 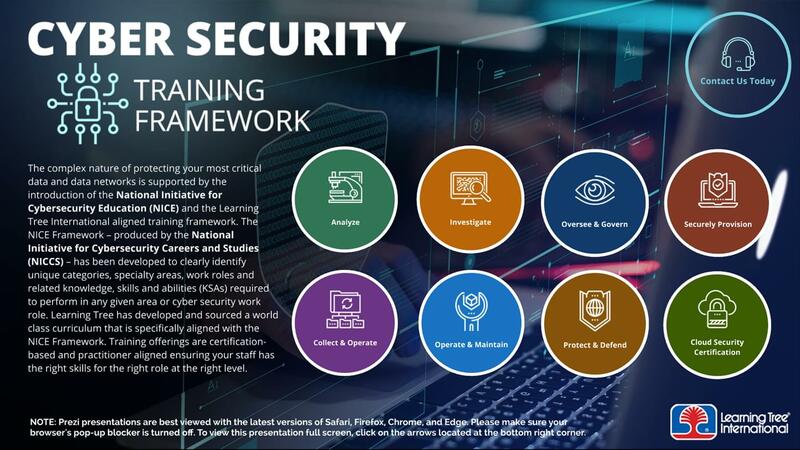 Furthermore, the National Initiative for Cyber Security Education (NICE) established a framework identifying common cybersecurity functions, specialty areas and job roles; highlighting the knowledge, skills and abilities to effectively protect organizational assets. See the presentation below for more detail on Learning Tree’s course offerings to advance knowledge and skills across the cyber security roles defined in the NICE framework. The biggest risk to protecting information and information systems in modern business operations are untrained employees and corrupt inside actors. Modern cyber security strategies now employ an enterprise-wide risk management posture across the entire organization, rather than isolating this strategy within IT. As part of this posture, organizational leaders continually consult with internal and external cyber security experts to review their human capital talent and critical thinking capabilities, business processes, system design, access management and the policies and safeguards governing organizational assets. In recognition of the 15th annual National Cyber Security Awareness Month - NCASM* recognized throughout North America in October 2018, Learning Tree offers you complimentary cyber resources to help apply best practices and adopt a proactive posture in your organization and in your life. How to Implement a People-First Cyber Culture?